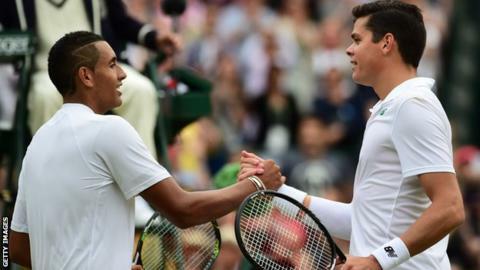 Wimbledon semi-finalist Milos Raonic and teenage Australian Nick Kyrgios will make their Aegon Championships debuts at Queen's Club from 15-21 June. The addition of 24-year-old Canadian Raonic means five of the world's current top 10 will be in the field. Kyrgios, 19, beat Rafael Nadal at last year's Wimbledon and is now ranked 34. The tournament has been upgraded to ATP 500 status, the third highest for men after Grand Slams and Tour Masters, and will be reduced from 56 players to 32. An additional $1m prize money has been allocated and an extra week scheduled between the French Open and the start of the tournament. Britain's Andy Murray, Nadal, Stan Wawrinka and Marin Cilic are the other top 10 players in the event, joined by world number 11 and defending champion Grigor Dimitrov, and four-time winner Lleyton Hewitt. "I love playing on grass, it suits my game a lot and I'm excited," said Kyrgios, who lost to Raonic in the Wimbledon quarter-finals and also reached the last eight at this year's Australian Open, where he was beaten by Murray in straight sets. "Wimbledon last year was my best experience so far, and every time I go to Britain I feel comfortable. I'm hoping for some big things on grass in the future."